Having fallen head over heels in love with the chocolates from L.A. Burdick, we were dying to know more about Pastry and Chocolate Chef Michael Klug. Amidst the busy Mother’s Day crunch, he was still kind enough to share some great insights about himself and chocolate. FoodMayhem (FM): You have worked at some fancy restaurants (Lespinasse and Chanterelle to name a few), some of the biggest names in the world. What drove your decision to switch from big city Pastry Chef to chocolatier of a smaller company? Chef Michael Klug (MK): Before I came to Burdick chocolate I was working my entire career in restaurant and hotel business establishments; and yes some of these where among the finest in the industry during this time. 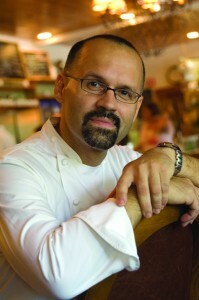 During my years at Lespinasse with Chef Gray Kunz we were always on the search on the best ingredients and products. In the summer of ’93 Kunz approached me if I would consider to actually purchase chocolates for our petit four assortments. Not that we didn’t like what we were making at Lespinasse, but Kunz thought a chocolate company had the better set up and efficiency to make a superior confection than a restaurant. And to his opinion L.A. Burdick was the highest standard of chocolate quality that he could find. After I tasted the chocolate for the first time I had to agree with him. From that time on we received Burdick chocolates every week fresh from Walpole, New Hampshire. When Larry Burdick approached me in the summer of 2002 to become the head chocolatier of his company I felt honored and excited. In addition, my son was just three months old and a move to the country from the big city seemed like a good idea.